Albert Fall – A gunman, lawyer, congressman, and rancher in New Mexico, he fought Ben Williams on September 15, 1895, on the streets of Las Cruces. Charles Fallon – A cowboy and gunman who, with companion Long-Haired Owens, fought one of the fiercest gun battles known in the West on July 4, 1884, at Lewistown, Montana against the Stuart cowboy-vigilantes. Fallon was shot nine times and killed. Henry Ferris – A Colorado gunman and lawyer, he was killed in Sterling in 1873. Tom Finnessy – A gunman and friend of Martin McRose. John King Fisher (1854-1884) – A gunman, outlaw, and lawman, Fisher gave up his outlaw ways and became the sheriff in Uvalde County, Texas in 1881. Three years later, both he and friend, Ben Thompson, were killed in an ambush in San Antonio, Texas. Joseph Foster – A gunfighter and gambler, he was shot and killed by King Fisher in San Antonio, Texas in 1884 when Fisher and Ben Thompson were shot by unknown gunmen. Joel Fowler (1849-1884) – A gunman, gambler, and rancher, he killed over twenty men, and was lynched on January 21, 1884, in Socorro, New Mexico. Frank Freeman – A New Mexico gunman who fought in the Lincoln County War, he was killed in Cimarron in late 1876. D.B. Frink – A gunman and member of the Truckee, California Committee of 601, he was accidentally killed in November 1874. Albert Jennings Fountain – A gunman, soldier, editor, and lawyer, he killed B.F. Williams on December 7, 1870 i,n EI Paso, Texas, and defended Billy the Kid in his first trial in Mesilla, New Mexico. He disappeared in the White Sands area on January 31, 1896. Thomas Gaffney – A member of the Seven Rivers Warriors who fought in New Mexico’s Lincoln County War. Afterward, he disappeared. J.G. Gallagher – A gunman, he shot and killed Alberto Martinez in January 1883 in the Steeple Rock District of New Mexico. Jose Trujillo Gallegos – A gunfighter, he killed Miguel Montano in March 1885 at Pederval, New Mexico. Pantaeleon Gallegos – A gunman in the Lincoln County War of New Mexico, he rode in the posse that killed John Tunstall on February 18, 1878. 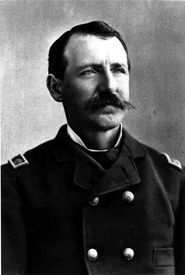 John Galvin – A member of the Seven Rivers Warriors who fought in New Mexico‘s Lincoln County War. He was killed by Regulators in Lincoln, New Mexico on April 30, 1878. Catarino Garza – A rebel gunman, Garza organized a gang of over 300 men, crossed the border into Mexico, and fought against Diaz. He was defeated and arrested for violating International Laws. He was later killed in Cuba during a revolution. Joe German – A gunman, German was killed by Frank Leslie in Eureka, New Mexico on June 22, 1881. James Gibbons – A gunman, he was charged with murder in 1891 at Clayton, New Mexico. Volney Gibson – A gunman, Gibson shot and killed Kyle Terry in 1889 at the courthouse in Galveston, Texas for killing L.E. Gibson. Fine Gilliland – A cowboy and gunman, Fine shot and killed Henry Harrison Powe on a roundup. He, himself, was later shot and killed by lawmen. Chris Gilson – A gunman, he participated in the Newton, Kansas gunfight in 1867 which left 14 gunmen dead. George Gladden – A gunman in the Mason County War in Texas, he was arrested on charges that included a jailbreakk. Convicted, he received a 99-year sentence but was later pardoned. John Joel Glanton – A gunman, he was outlawed by Sam Houston when he fought on both sides in the Regulator-Moderator War in East Texas. He was arrested, escaped, and led a gang of scalp hunters. He was later killed by Indians in 1850 at Yuma, Arizona. John Golden – A gambler and gunman, he was lynched by a mob in 1876 outside Fort Griffin, Texas. Francisco Gomez – Fought with the Regulators in the Lincoln County War of New Mexico. He survived the conflict and died in July, 1946 at his home in New Mexico. Gabriel Gonzolez – A New Mexico gunman, he killed Adolf Harmon in Springer, New Mexico in August 1, 1907, an act that started a feud. Ignacio Gonzales – Fought with the Regulators in the Lincoln County War of New Mexico. Afterward, he disappeared. John H. Good – A gunman and rancher, Good, shot and killed Charles Dawson on December 8, 1885, in La Luz, New Mexico. He was later involved in the Lee-Good feud with Oliver Lee. Walter Good – A gunman and son of John Good, he started the Good-Lee feud by ambushing George McDonald on June 13, 1888. He was found dead in the White Sands area of New Mexico. Bill Goodlet – Lawman turned gunman, Goodlet was a member of the Dodge City Gang in Las Vegas, New Mexico. Mike Gordon – A gunman, Gordon was shot in Las Vegas, New Mexico on July 19, 1879. Dolly Graham, aka: George Davis – A member of Jesse Evans Gang during New Mexico’s Lincoln County War. He was killed by Texas Rangers in the Chinati Mountains, Texas on July 3, 1880. John Do Graham – A gunman in the Pleasant Valley War of Arizona, he was killed in Holbrook, Arizona in September 1887. Thomas Ho Graham – A gunman in the Pleasant Valley War of Arizona and brother of John, he was ambushed and killed at Tempe, Arizona in August 1892. Joe Grant – A gunman and bounty hunter, he attempted to bring in Billy the Kid. However, the Kid shot him and he died on January 10, 18 80. Mit Graves – A Texas gunman, he allegedly killed two members of the Truitt family in connection with a feud in Hood County, Texas in 1874. Thomas Green – A member of the Seven Rivers Warriors who fought in New Mexico’s Lincoln County War. He was killed, probably by Regulators in Lincoln, New Mexico on April 30, 1878. Francisco “Pancho” Griego (18? ?-1875) – Hailing from Santa Fe, New Mexico, Griego was living in Colfax County, New Mexico by the 1870s working as a businessman and a cowboy. Not long after his arrival, he had gained a reputation for his terrible temper. On May 30, 1875, after arguing over cards with several cavalrymen at a saloon in Cimarron, he shot two of them to death and killed another with a knife. A few months later, Greigo’s friend and business associate, Cruz Vega, who was suspected of killing the local minister in the Colfax County War, was lynched by a mob led by Clay Allison. Griego soon sought out Allison, intending on taking his revenge. Instead, when Griego tried to get the drop on Allison on November 1, 1875, he wound up dead. I don’t know why, but all I could do was wonder, then ask> For a list of Gunfighters. I saw the movies and read of Roland. ” The Last Gunsinger…” Clint, Clive, Cort, Clyde, Culbert, Cuthbert, and the Cimmaron Kid… It was an untold story in my mind of the “magnificent 7”, thanks.